In A First, Connecticut's Animals Get Advocates In The Courtroom : The Two-Way The state's legal advocates are one sign of the emerging field of animal law. In 2000, nine law schools had courses in animal law; by 2015, that number was 151. 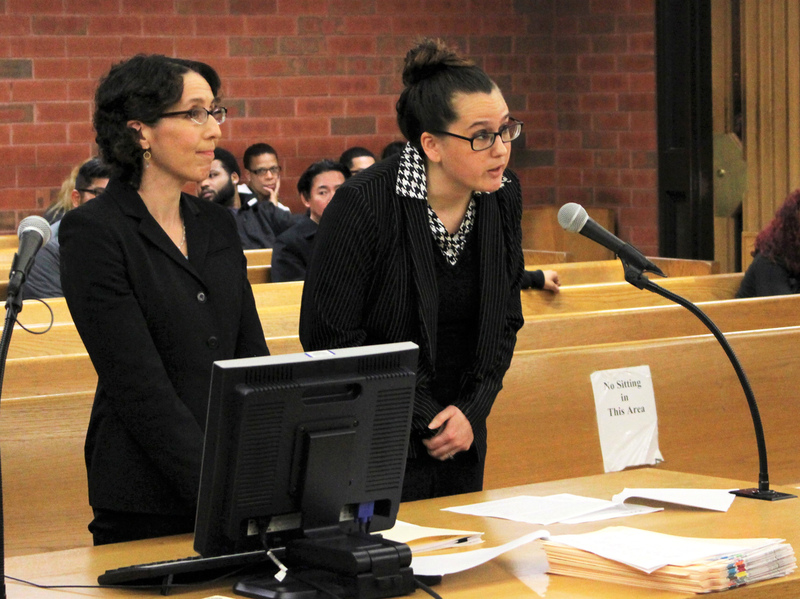 University of Connecticut law professor Jessica Rubin, left, and law student Taylor Hansen present arguments as animal advocates in a dogfighting case in Hartford on Tuesday. Connecticut is the first state to allow court-appointed advocates to represent animals in cruelty and abuse cases. A Connecticut law makes it the first state to provide animals with court-appointed advocates to represent them in abuse and cruelty cases, similar to laws that provide for victim's or children's advocates. Seven lawyers and a law professor in the state are approved as volunteer advocates, the AP reports. Judges have discretion on whether to appoint an advocate; defense attorneys and prosecutors may request them. This week University of Connecticut student Taylor Hansen was the first of the advocates to testify in court, in a dogfighting case, alongside the approved law professor, Jessica Rubin. The case involves three pit bulls, according to the AP: "One emaciated dog with scars from fighting had been found wandering. The other two were found in a home filled with animal feces, rotting food and evidence of dogfighting. One animal had to be euthanized." Hansen argued – unsuccessfully, in the end — that the man charged in the case should not be allowed to participate in a program for first-time offenders, in which his record would eventually be cleared. That outcome is one that has happened before, in the case for which Connecticut's law is named. Desmond's Law is named after "a shelter dog that was starved, beaten and strangled to death" in 2012, according to the Hartford Courant. "Despite a recommendation by the prosecutor for prison time, the man charged in the crime received accelerated rehabilitation, which meant that his charges were dismissed and his record was wiped clean." "The animal advocates are an official party to the case," the AP explains. "They can do investigative work prosecutors often don't have time for, such as interviewing veterinarians and other witnesses. They also make arguments, write briefs and make recommendations to the judge." Between 2006 and 2016, only a small portion – 19 percent – of Connecticut's 3,723 animal abuse or cruelty cases ended in convictions, according to the wire service. One percent of the cases resulted in not-guilty verdicts, but the bulk – 80 percent – of cases were dismissed or not prosecuted. Hansen, the advocate, found value in the process, even if the outcome wasn't the one she had argued for. "It showed the animals do have a voice," she told the AP. "We are able to have an impact on the proceedings." Advocates like Hansen are part of the emerging field of animal law. According to the Animal Legal Defense Fund, nine law schools had courses in animal law in 2000; by 2015, that number was 151. That growth is due in part to a few deep-pocketed animal lovers. Former The Price Is Right host Bob Barker has donated $1 million to several law schools to create endowments for the study of animal-rights law. And last year philanthropist Charles Thomas gave $1 million to Harvard Law School's Animal Law & Policy Program with the goal of helping farm animals. Studies have found connections between animal abuse and violence against people. In one study cited by the Humane Society, the Chicago Police Department found that 65 percent of those arrested for animal crimes had also been arrested for battery against another person. Another study found that pet abuse was a significant risk factor for people inflicting violence against their intimate partners. "We hope with this law in place, we will start to see much better procedural outcomes [in animal abuse cases]," Annie Hornish, Connecticut director for the Humane Society of the United States, told the AP. "We are very excited that judges seem to be taking advantage of it." A previous version of this story referred to a donation to the Harvard Law School from Jeff C. Thomas. The school's website refers to him as Charles Thomas. Previously corrected June 6, 2017: A previous version of this story misspelled a reference to Taylor Hansen's last name as Hanson.